Background & objectives: Aedes aegypti and Ae. albopictus are major arboviral vectors that are considered to lay eggs, and undergo preimaginal development only in fresh water collections. However, recently they have been also shown to develop in coastal brackish water habitats. The ability of the biologically variant salinity-tolerant Aedes vectors to transmit arboviral diseases is unknown. We therefore, investigated the infection of salinity-tolerant Aedes mosquitoes with dengue virus (DENV) and analysed dengue incidence and rainfall data to assess the contribution of salinity-tolerant Aedes vectors to dengue transmission in the coastal Jaffna peninsula in Sri Lanka. Methods: Brackish and fresh water developing female Ae. aegypti and Ae. albopictus were tested for their ability to become infected with DENV through in vitro blood feeding and then transmit DENV vertically to their progeny. An immunochromatographic test for the NS1 antigen was used to detect DENV. Temporal variation in dengue incidence in relation to rainfall was analysed for the peninsula and other parts of Sri Lanka. Results: Aedes aegypti and Ae. albopictus developing in brackish water, became infected with DENV through in vitro blood feeding and the infected mosquitoes were able to vertically transmit DENV to their progeny. Monsoonal rainfall was the discernible factor responsible for the seasonal increase in dengue incidence in the peninsula and elsewhere in Sri Lanka. Interpretation & conclusion: Fresh water Aedes vectors are main contributors to the increased dengue incidence that typically follows monsoons in the Jaffna peninsula and elsewhere in Sri Lanka. It is possible however, that brackish water-developing Aedes constitute a perennial reservoir for DENV to maintain a basal level of dengue transmission in coastal areas of the peninsula during the dry season, and this supports increased transmission when monsoonal rains expand populations of fresh water Aedes. Dengue fever is the most common arboviral disease of humans, with a recent estimate of 390 million infections per year worldwide, of which 96 million show clinical manifestations. Aedes aegypti and Ae. albopictus are the major vectors of dengue in several countries including Sri Lanka,,,,. These two Aedes species are also vectors of chikungunya in many countries, while Ae. aegypti is an established vector of yellow fever and Zika in several countries. Eliminating, minimizing and larviciding pre- imaginal developmental habitats of the two Aedes vectors and the application of insecticides through fogging and residual spraying at infection foci are the mainstay of global approaches for controlling dengue. There has been a long-held and prevalent view that Ae. aegypti and Ae. albopictus oviposit and undergo preimaginal development only in fresh water collections, and therefore only fresh water habitats in the vicinity ofhuman dwellings are presently targeted in dengue vector control programmes,. Sri Lanka is an Island with an area of 65,515 km located between latitudes 5°55’ and 9°51’ N and longitudes 79°41’ and 81°53’ E . It is composed of 25 administrative districts. The central hills of the island divide the surrounding plains into dry and wet rainfall zones [Figure 1]. The wet zone, located in the central hills and the southwest part of the island, receives an average annual rainfall of 250 cm in two main rainy seasons, viz. the northeast (NE) monsoon that typically commences in October and ends in January, and the southwest (SW) monsoon that often begins in April and ends in June. Inter-monsoonal rains also occur between these periods in the wet zone. The dry zone, with an annual rainfall of 60 to 190 cm, receives maximal rainfall during the NE monsoon, and typically little or no rain for the rest of the year. An intermediate zone, with mixed characteristics, lies between the dry and wet zones [Figure 1]. The Jaffna peninsula falls within the dry zone and is located at the northern tip of Sri Lanka in close proximity to India. Together with several small islands in the intervening Palk straits, it comprises the Jaffna administrative district [Figure 1]. The peninsula has a maximum altitude of 10.4 m and contains many lagoons and sea water inlets. All locations in the Jaffna district are less than 10 km from the sea and therefore the entire district may be considered as coastal zone. The Jaffna district has a land area of1100 km and an average population density of approximately 700 persons per km. Figure 1: Map of Sri Lanka showing the different rainfall zones and the 25 administrative districts with the incidence of dengue in the year 2016 as the number of cases/100,000 persons. The northern Jaffna district encompassing the Jaffna peninsula is highlighted in black. The numerical data for incidence in each district is tabulated on the left of the map. The size of the circle indicates the proportion of reported number of cases for each district. Dengue has been reported in Sri Lanka since the beginning of the 20th century, but its prevalence has increased after in 1990 with four serotypes of the dengue virus (DENV), DENV 1– 4, being detected in the island,. Dengue incidence continues to be high in Sri Lanka with 55,150 total cases reported for the island in 2016 . The diagnosis of dengue is mainly based on clinical criteria in Sri Lanka, with only a small proportion of cases subsequently confirmed by serological tests for antibodies to DENV or the presence of DENV nucleic acid by RT-PCR. Dengue is one of the notifiable diseases in Sri Lanka where it is legally binding for the Ministry of Health to be informed of the diagnosis of dengue in any patients. Aedes aegypti and Ae. albopictus larvae have been recently observed in discarded food and beverage containers having brackish water with up to 15 and 14 parts per thousand (ppt) salt respectively along beaches,; and in domestic wells with up to 9 ppt salt in coastal areas of the Jaffna peninsula. Saline, brackish and fresh water are defined as containing >30, 0.5-30 and <0.5 ppt salt respectively,,. Salinity adaptation in Ae. aegypti is reflected in inheritable as well as reversible biological changes. High brackish-water larval positivity rates are associated with a high incidence of dengue in precincts of Jaffna City that borders the sea,. The observation of salinity-tolerant Ae. aegypti and Ae. albopictus in Sri Lanka has been subsequently confirmed by findings in coastal areas of other countries, viz. Brunei Darussalam, Florida, USA and Sao Paulo state, Brazil. The development of these two Aedes vectors in coastal brackish water may partly be an adaptive response to the extensive use of insecticides for agriculture in inland areas, the application of larvicides exclusively to fresh water habitats of the two vectors and increasing coastal salinization leading to a greater availability of brackish water habitats,. Such anthropogenically-induced adaptive changes in mosquito vectors can lead to range expansion, facilitating invasion to neighbouring territories. Many countries, particularly in Southeast Asia, have extensive coastlines, high coast to land area ratios, and a large proportion of their populations living in coastal areas. They are therefore, particularly susceptible to the transmission of dengue and other arboviral diseases by brackish water Aedes vectors—A vulnerability that may become more pronounced as climate change causes sea levels to rise and increase saline intrusion in coastal locations,. To address gaps in existing knowledge, the present study investigated the relative contribution of Aedes vectors, that develop in brackish and fresh water habitats in coastal areas, to dengue transmission by relating dengue incidences to monsoonal rains, and explored the possibility of brackish water female Ae. aegypti and Ae. albopictus becoming infected with DENV, and then vertically transmit DENV to their progeny. Human blood for feeding mosquitoes on membrane feeders was donated by adult volunteers with their written-informed and free consent. The protocol for feeding mosquitoes on laboratory animals was approved by the Institutional Animal Ethics Committee of the University of Jaffna (AERC/2014/02). Data on the total number of dengue cases in each of the 25 administrative districts of Sri Lanka were obtained from the Epidemiology Unit of the Ministry of Health and monthly rainfall for the Jaffna and Colombo districts from the Meteorological Department of the Government of Sri Lanka. The population of each of the districts was obtained from the Department of Census, Government of Sri Lanka for the year 2014 and used to calculate the dengue incidences per 100,000 inhabitants for the 25 districts. Aedes aegypti and Ae. albopictus larvae collected from fresh and brackish-water habitats in inland and coastal locations of the Jaffna peninsula respectively were used to establish respective self-mating colonies that were maintained in 10 ppt salinity (brackish water colony) and 0 ppt salinity (fresh water colony) as previously described,,. Adult females (3–5 days old) maintained in the laboratory were used to determine their ability to become infected with DENV by feeding them on DENV-containing human blood. Additionally, to more closely mimic the situation in the field, the first generation of Ae. aegypti adult females emerging from larvae collected from brackish water domestic wells of 5–9 ppt salinity in Kurunagar in the Jaffna peninsula, and maintained in the same well water were also tested. For each infectivity experiment, approximately 25 each of Ae. aegypti and Ae. albopictus females were starved for 24 h prior to feeding on DENV. DENV serotype 1 cultured in the C6/36 clone of Ae. albopictus cells (approximate viral titre of 107 pfu/ml) was obtained from the Medical Research Institute, Colombo, Sri Lanka and stored in liquid nitrogen. Thawed virus suspension was mixed immediately with washed uninfected erythrocytes of human blood in a 2 : 3 v/v ratio. An artificial membrane blood feeding technique was employed essentially as described for anopheline mosquitoes. The bottom of the membrane feeder covered with parafilm was placed on top of the netting on a plastic cup containing female mosquitoes to commence the feeding. The mosquitoes were allowed to feed for 30 min at 37°C. After feeding, the fully-engorged females from each set were separated from the partially blood fed and non-blood fed mosquitoes. The fully engorged females were individually transferred to clean plastic cups and the cups covered with mosquito netting were kept in a containment condition in the insectary to prevent accidental escape into the environment. Glucose (10%) on cotton wool pledgets was provided to blood-fed females which were maintained under laboratory conditions (18±2 °C, 70–80% relative humidity) for an approximate extrinsic incubation period of 12 days before the mosquitoes were individually assayed for DENV infection in the head and thorax, that was isolated by dissection from the rest of the body. The salivary glands where DENV accumulates to transmit infection in a subsequent blood feed are present in the head and thorax section. The head/thorax tissue from each mosquito was individually triturated in a microfuge tube with a plastic disposable pestle for extracting soluble antigens in 100 μl of 0.01M phosphate buffered saline (PBS) containing 1% v/v Triton X-100. The extract was then centrifuged at 10,000 g for 5 min, and the supernatant was tested for DENV NS1 antigen using the BIOLINE DENV NSI antigen test strip (Standard Diagnostics, Gyeonggi-do, Korea) according to the manufacturer’s instructions. Brackish and fresh water-derived Ae. aegypti and Ae. albopictus females that fully engorged on DENV-infected blood were allowed to lay eggs and the ensuing whole larvae and whole adult male and female progeny were extracted in PBS Triton X100. Pooled extracts from 7–11 individual larvae and adults were separately tested for infection with DENV using the BIOLINE DENV NSI antigen test strip. The calculated dengue incidence in each of the 25 administrative districts in Sri Lanka for 2016 is shown in [Figure 1]. Many southwestern coastal districts have a relatively high incidence of dengue while the Nuwara Eliya district, which is the highest altitude inland area in the centre of the country, has a noticeably low incidence. The SW of the island is densely populated and many southwestern districts such as the Colombo district that includes the administrative capital of Sri Jayewardenapura, are economically more advanced and possess better health services than the rest of the country. Colombo district had the highest district-wise dengue incidence of 716 per 100,000 persons in 2016. Factors such as human population density, the efficacy of case detection in the health sector, housing infrastructure and vector control measures influence the incidence data for the different districts. In 2016, the incidence of dengue in the Jaffna district was 416 per 100,000 persons (second highest in the Sri Lanka) [Figure 1]. The monthly rainfall data for the period 2012–16 for the dry zone district of Jaffna is shown in [Figure 2]a. This was compared with the data for the Colombo district [Figure 2]b located within the wet rainfall zone. The comparison data shows that Jaffna receives much of its rain from the NE monsoon in most years with the year 2016 being somewhat exceptional due to unusual high rainfall from a strong SW monsoon. The Colombo district regularly received rain from both the NE and SW monsoons as well as inter-monsoonal rains in intervening periods. Figure 2: Monthly total rainfall data for the period 2012–2016 for (a) Jaffna district; and (b) Colombo district, Sri Lanka. The monthly number of dengue cases in the years 2012 to 2016 for the whole country is shown in [Figure 3]a. The data shows that dengue incidence in the whole island peaks soon after the SW monsoon every year with an additional peak following the NE monsoon. During the five-year period, the SW monsoon tended to peak in April- May and was noticeably stronger in 2016 [Figure 2]b. The incidence of dengue tended to reach a peak in June-July, i.e. approximately one month after the peak of the SW monsoon. The NE monsoon tended to peak in October- November for the period 2012–16 [Figure 2]b and this was followed by a peak in dengue incidence in December–January, i.e. approximately one month after peak rainfall. Figure 3: Total number of dengue case per month (above) and year-wise (below) for the period 2012–2016 in, (a) Whole of Sri Lanka; (b) Colombo district; and (c) Jaffna district. The temporal variation in dengue incidence in the period 2012–16 in the Colombo district lying in the wet rainfall zone in the SW of the island is shown in [Figure 3]b. The results show the temporal variations in dengue incidence in the district, mirrors that for the whole island shown in [Figure 3]a. This reflects (a) the dominant contribution of the pattern of rainfall in the wet zone to the composite rainfall data for the whole island, (b) tendency for peaks of dengue incidence to occur approximately one month after the peak of monsoon rains, and (c) location of most of the island’s population in Colombo and other southwestern districts. The temporal variation in dengue incidence over the past five years in the Jaffna district is shown in [Figure 3]c. The data shows that the incidence of dengue in Jaffna regularly increases approximately one month after the peak of the NE monsoon. Dengue incidence then decreases with the end of the rains to be maintained at a low level during the dry season. The incidence of dengue also shows a smaller and more variable peak soon after the onset of the SW monsoon rainfall which is normally weak in the Jaffna district. 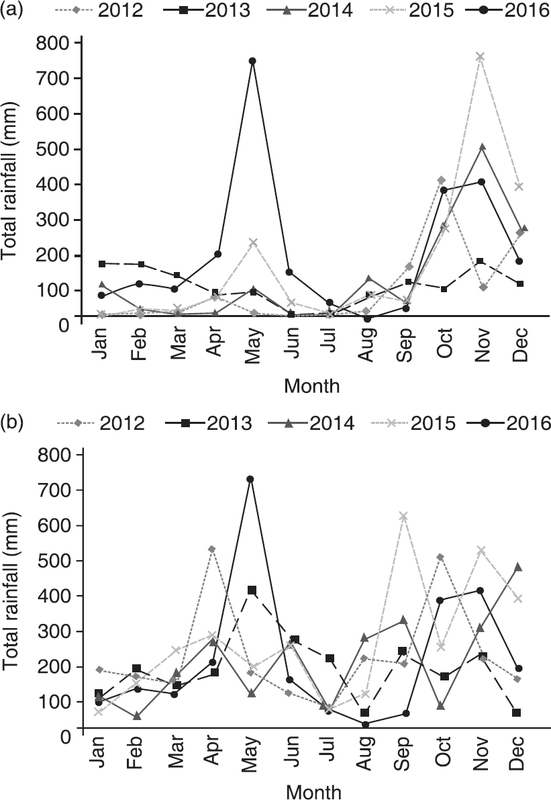 A noticeably higher peak of dengue incidence was observed in July 2016, two months after an atypically strong SW monsoon that resulted in unusually high rainfall in May 2016 in the Jaffna district [Figure 2]a. During the first ten weeks of 2017 approximately 1172 cases of dengue were reported in Jaffna district. The rise in dengue incidence soon after the NE monsoon is a more pronounced feature in the dry zone district of Jaffna that received its rainfall mainly from the NE monsoon when compared with the whole island for the same period [Figure 3]a and [Figure 3]c.
[Table 1] shows the DENV-serotype 1 infection rates in the head/thorax of the fully-engorged, DENV-infected, blood fed female mosquitoes as well as the DENV infection rates in their larval and adult progeny. The results in [Table 1] were obtained 12 generations after colony establishment and are consistent with findings from earlier generations. Infection was also similarly demonstrable with DENV-serotype 2 in the salinity-tolerant laboratory Aedes colonies (data not shown). Representative results of NS1 antigen tests carried out on head and thorax extracts (containing the salivary glands) of Ae. albopictus collected from both fresh and brackish water are shown in [Figure 4]. NS1 antigen was never detected in similar extracts of the two Aedes species that fed on uninfected blood. The results in [Table 1] demonstrate that salinity-tolerant Ae. aegypti and Ae. albopictus from the laboratory colonies as well as salinity-tolerant Ae. aegypti recently collected from field habitats can become infected with DENV through blood-feeding in a manner similar to fresh water Ae. aegypti and Ae. albopictus. 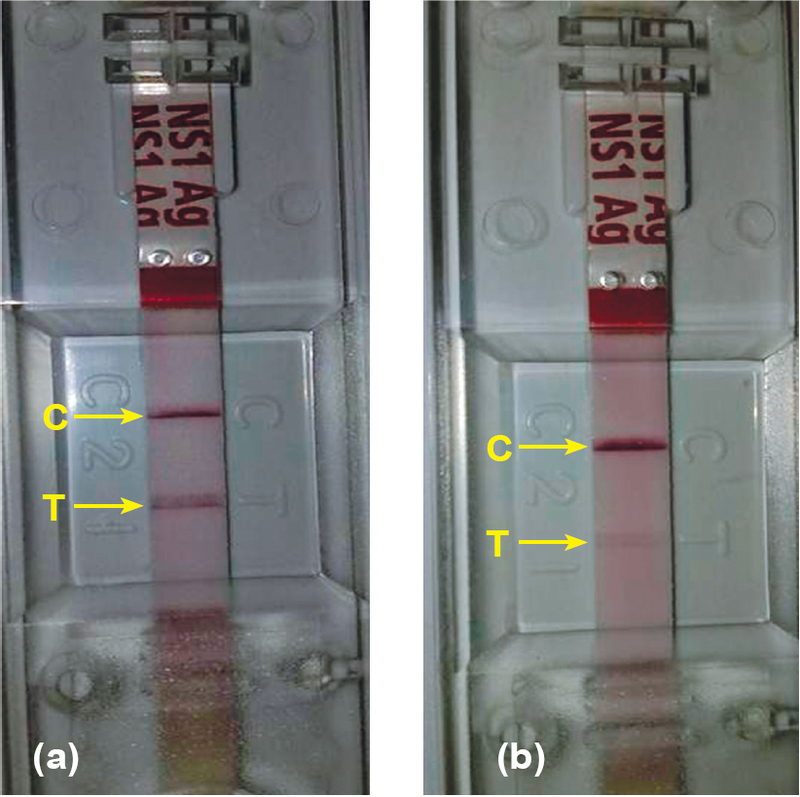 Figure 4: Images showing the results of the NS1 antigen test on the head/thorax extract of blood fed Aedes albopictus–(a) From the fresh water colony; and (b) From the brackish water colony maintained in 10 ppt salt. Both strips show reactions producing a control band C and a test band T. The T band is not observed when uninfected blood fed Aedes are tested. The results further showed that salinity-tolerant Ae. aegypti and Ae. albopictus from the laboratory colonies, like their fresh water counterparts, are also capable of transmitting DENV vertically to their progeny through a process that is sometimes also referred to as transovarial transmission. The immunochromatography-based BIOLINE DENV NSI antigen test is used for detecting DENV in mosquitoes as well as in human blood. It’s usage in this study showed that DENV is present after an extrinsic incubation period of 12 days in the head and thorax segments (containing the salivary glands) in a proportion of brackish water-derived Ae. aegypti and Ae. albopictus, artificially fed in vitro on blood containing DENV. This observation suggests that salinity-adapted Ae. aegypti and Ae. albopictus may transmit DENV like their fresh water counterparts. However, not all the mosquitoes that took a full infected blood meal had detectable NS1 antigen in the head and thorax. The NS1 antigen-negative mosquitoes may either have failed to be productively infected with DENV or be infected in the salivary glands at levels below the threshold of detection of the BIOLINE DENV NSI antigen test. It has been established that Ae. aegypti and Ae. albopictus developing in fresh water transmits DENV vertically to progeny mosquitoes,,. The findings of this study showed that brackish water-developing Ae. aegypti and Ae. albopictus, notwithstanding the other biological changes associated with salinity adaptation, retained the ability to vertically transmit DENV to their progeny. Vertical transmission can increase the numbers of DENV-in- fected Aedes vectors in a population besides those that become infected through blood-feeding on dengue patients. The rainfall and dengue incidence data strongly suggest that Ae. aegypti and Ae. albopictus developing in rapidly expanding fresh water habitats, that are formed as a result of the monsoons, are the main drivers of seasonal epidemics of dengue transmission throughout Sri Lanka. Importantly, this also holds true for the dry zone coastal district of Jaffna that receives its rainfall mainly from the NE monsoon and where the pre-imaginal development in brackish water habitats was first documented for the two Aedes vectors,,,. The increased dengue transmission peaks approximately one month after the peak in rainfall, coincident with the expected increase in densities of vector mosquitoes emerging from expanded fresh water habitats. Larval control measures are not typically applied to brackish water habitats at present in the Jaffna peninsula or other coastal areas in the world. Salinity-tolerant Aedes vectors are therefore an unappreciated source that can maintain basal-level dengue transmission in coastal areas during the dry, low-transmission season. Some brackish water habitats such as coastal wells constitute perennial habitats that are relatively independent of rainfall. Other brackish water habitats, e.g. discarded containers and coastal rock pools, may be formed as a results of interactions between rainfall, sea spray and tidal movements. Importantly, the results show that salinity-adapted Aedes in coastal zones may act as a reservoir of DENV to support the monsoon-dependent amplification of dengue transmission by fresh water vectors. Salinity-tolerant Aedes are easily able to readapt and develop in fresh water habitats as previously shown, and can therefore also take advantage of the expansion in fresh water habitats due to the monsoons and then directly contribute to dengue transmission in the peninsula. Vertical transmission of DENV can further contribute in maintaining the reservoir of DENV in both fresh and brackish water Aedes during the dry season, which is more prolonged in Jaffna than in the wet zone districts of Sri Lanka. A similar study has suggested that vertical transmission contributes in maintaining a reservoir of DENV during the dry season and it is a key etiological feature in the seasonal epidemics of dengue that occur with the onset of rains in Rajasthan, India. Aedes vectors developing in fresh water are main contributors to the increased dengue transmission that typically follows Northeast and Southwest monsoons in the Jaffna peninsula and elsewhere in Sri Lanka. However, the role of brackish water-developing Aedes can’t be ignored, because they can constitute a perennial reservoir for DENV to maintain a basal level of dengue transmission in coastal areas of the peninsula during the dry season, supporting an increase in transmission that occurs when monsoonal rains expand populations of fresh water Aedes. The study for the first time showed that brackish water developing Aedes vectors have the potential to transmit DENV. Further studies on the relative vector bionomics of brackish and fresh water Aedes vectors in relation to rainfall in coastal zones is important for controlling and eliminating the arboviral diseases they transmit. The findings also suggest that international and national guidelines for dengue control should also consider coastal salinity-tolerant Aedes vector reservoirs, that are presently not targeted in dengue control programmes. The authors acknowledge partial financial support from the University of Jaffna (URG/2016/SEIT/05) and the Meteorological Department of Sri Lanka for rainfall data. Bhatt S, Gething PW, Brady OJ, Messina JP, Farlow AW, Moyes CL et al. The global distribution and burden of dengue. Nature 2013; 496: 504-7. Tissera H, Weeraman J, Amarasinghe A, Wijewickrama A, Palihawadana P, Fernando L. Expediency of dengue illness classification: The Sri Lankan perspective. WHO South East Asia J Public Health 2014; 5(1): 5-7. Sirisena PDNN, Noordeen F. Dengue control in Sri Lanka–Challenges and prospects for improving current strategies. Sri Lankan J Infect Dis 2016; 6(1): 2-16. Sirisena PDNN, Noordeen F. Evolution of dengue in Sri Lanka- Changes in the vector, virus and climate. Int J Infect Dis 2014; 19: 6-12.
WHO Fact sheet No. 117—Dengue and severe dengue. Available from: http://www.who.int/mediacentre/factsheets/fs117/en/. (Accessed on March 30, 2017). Barraud PJ. The Fauna of British India, including Ceylon and Burma, v. V, Diptera: Culicidae. Tribes: Megarhines and Culicine. In: Sewell RBS, Edwards PW, editors. London: Taylor and Francis 1934. Trends in dengue cases. Sri Lanka: Epidemiology Unit 2017. Available from: http://www.epid.gov.lk/web/index.php?option= com_casesanddeaths&Itemid=448&lang=en (Accessed on April 10, 2017). Senaratne TN, Noordeen F. Diagnosis of dengue in Sri Lanka: Improvements to the existing state of the art in the island. Trans R Soc Trop Med Hyg 2014; 108: 685-91. Ramasamy R, Surendran SN, Jude PJ, Dharshini S, Vinobaba M. Larval development of Aedes aegypti and Aedes albopictus in peri-urban brackish water and its implications for transmission of arboviral diseases. PLoS Negl Trop Dis 2011; 5(11): e1369. Jude PJ, Tharmasegaram T, Sivasubramaniyam G, Senthilnanthanan M, Kannathasan S, Raveendran S, et al. Salinity-tolerant larvae of mosquito vectors in the tropical coast of Jaffna, Sri Lanka and the effect of salinity on the toxicity of Bacillus thuringiensis to Aedes aegypti larvae. Parasit Vectors 2012; 5: 269. Surendran SN, Jude PJ, Thabothiny V, Raveendran S, Ramasamy R. Pre-imaginal development of Aedes aegypti in brackish and fresh water urban domestic wells in Sri Lanka. J Vector Ecol 2012; 37: 471-3. Ramasamy R, Jude PJ, Veluppillai T, Eswaramohan T, Surendran SN. Biological differences between brackish and fresh water-derived Aedes aegypti from two locations in the Jaffna peninsula of Sri Lanka and the implications for arboviral disease transmission. PLoS One 2014; 9(8): e104977. Kannathasan S, Suthakar K, Jude PJ, Surendran SN. Potential risk areas for dengue in the Jaffna Municipal Area in Northern Sri Lanka. J Natl Sci Found Sri Lanka 2013; 41(2): 165-8. Idris FH, Usman A, Surendran SN, Ramasamy R. Detection of Aedes albopictus pre-imaginal stages in brackish water habitats in Brunei Darussalam. J Vector Ecol 2013; 38: 197-9. Yee DA, Himel E, Reiskind MH, Vamosi SM. Implications of saline concentrations for the performance and competitive interactions of the mosquito Aedes aegypti (Stegomyia aegypti) and Aedes albopictus (Stegomyia albopictus). Med Vet Entomol 2014; 28(1): 60-9. Arduino MB, Mucci LF, Serpa LLN, Rodrigues MM. Effect of salinity on the behaviour of Aedes aegypti populations from the coast and plateau of southeastern Brazil. J Vector Borne Dis 2015; 52(1): 79-87. Ramasamy R, Surendran SN. Possible impact of rising sea levels on vector-borne infectious diseases. BMC Infect Dis 2011; 11: 18. Ramasamy R, Surendran SN. Mosquito vectors developing in atypical anthropogenic habitats—Global overview of recent observations, mechanisms and impact on disease transmission. J Vector Borne Dis 2016, 53(2): 91-8. Ramasamy R, Surendran SN, Jude PJ, Dharshini S, Vinobaba M. Adaptation of mosquito vectors to salinity and its impact on mosquito-borne disease transmission in the south and southeast Asian tropics. In: Morand S, Dujardin JP, Lefait-Robin R, Chamnarn A, editors. Socio-ecological dimensions of infectious diseases in Southeast Asia. Singapore: Springer 2015; p. 107-22. Srikrishnaraj KA, Ramasamy R, Ramasamy MS. Antibodies to Anopheles midgut reduce vector competence for Plasmodium vivax malaria. Med Vet Entomol 1995; 9: 353-7. Tan CH, Wong PS, Li MZ, Vythilingam I, Ng LC. Evaluation of the Dengue NS1 Ag Strip® for detection of dengue virus antigen in Aedes aegypti (Diptera: Culicidae). Vector Borne Zoo- notic Dis 2011; 11 (6): 789-92. Khin MM, Than KA. Transovarial transmission of dengue 2 virus by Aedes aegypti in nature. Am J Trop Med Hyg 1983; 32(3): 590-4. 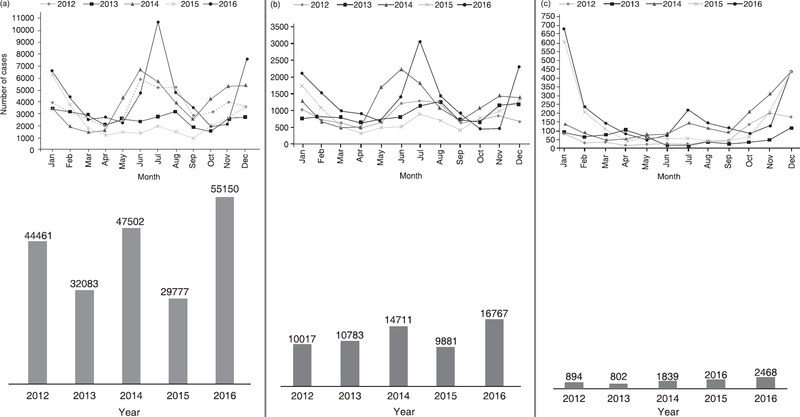 Angel B, Joshi V. Distribution and seasonality of vertically transmitted dengue viruses in Aedes mosquitoes in arid and semi-arid areas of Rajasthan, India. J Vector Borne Dis 2008, 45(1): 56-9. Arunachalam N, Tewari SC, Thenmozhi V, Rajendran R, Paramasivan R, Manavalan R, et al. Natural vertical transmission of dengue viruses by Aedes aegypti in Chennai, Tamil Nadu, India. Indian J Med Res 2008, 127(4): 395-7.